Bacon. Tofu. Two proteins on the opposite ends of the food social scale. One is revered, serenaded, hailed as the food of the Gods. The other is reviled, sneered at, as being bland, boring, even disgusting. When I saw this conflict depicted as bendable figurines (via Serious Eats) I had to do something to end this conflict. The only reason why tofu is put down is because of its mishandling by well meaning but unskilled cooks who focused only on its healthy benefits. There are plenty of Westerners who hate tofu, but you'd be hard put to find many Asians who do. That is becase in eastern Asian cuisines, tofu is infused with other flavors, as it should be. Several strips of bacon, depending on the size. A leaner type bacon is preferred. You can even use proscuitto. Drain the tofu, and wrap in several layers of paper towels. Place on a plate and put a board or another plate on top. Leave for a few minutes to drain some water out of the tofu. Unwrap and cut into bite sized pieces that are about the width of your bacon. Wrap each piece in bacon, going around at least once so the ends overlap. You may need to cut the bacon. Heat up a non-stick frying pan over medium-high heat. Put the bacon wrapped tofu pieces with the overlapping edges side down. Cook until crisp, then turn. Keep cooking and turning until done on all sides. A sweet-salty variation is to add a little bit of soy sauce to the pan, and a sprinkle (maybe about 2 tsp.) of brown sugar; stir rapidly to melt the sugar, then turn the bacon-tofu in the sauce until the moisture has largely evaporated. Eat hot or at room temperature, preferably with plain rice as part of a Japanese meal. Also a nice appetizer or sake drinking accompaniment. Submitted by maki on 2008-01-17 22:40. That sweet-salty combination of brown sugar and soy sauce sounds yummy. very interesting. Thanks for sharing this, I had never heard of this combination before. I have some turkey bacon in the fridge, I should give this a try! Totally making this with turkey bacon and fried tofu that was available at the Asian market-so far it looks great! We just did bacon-wrapped mochi (5 min in a medium fry pan until the mochi gets melty and the bacon is crisp). The dipping sauce (from a Japanese cooking mag) was a mix of Korean red pepper paste, vinegar, soy sauce, and mirin. Too good. Will have to try the tofu version, of course, but really you could wrap almost anything neutral tasting in bacon and it would be great (hence the classic bacon and water chestnuts). I made it and it was yummy. Thats such a yummy recipe!!! I had it for lunch today mjam. You live here in Swizerland right? where do you get the japanese ingrediants for your Recipes? I found a lot Asia-shops, but most of them don't have tipical japanese stuff like umeboshi, edamame or so. thanks a lot for this woderful website!!! Sounds like a good and healthy appetizer... except for the bacon... hmm, bacon. This is fantastic! So simple, yet so delicious looking. Great combination. I will be sure to try out this recipe for dinner. There is something inherently wrong about wrapping tofu in bacon. Perhaps it is my vegan or health-conscious friends, but I bet it is amazingly delicious! I just want people to get away from the idea of tofu as this bland, healthy food that people only eat as a meat substitute or to feel self-righteous and sacrificing. It's a great food in its own right, and here the creamy blandness is a perfect foil for the crisp saltiness of the bacon. Tofu FTW! The bacn wrapped tofu was delicious. My husband made it a few nights ago. I was pleasantly surprised by it's wonderful/interesting flavor. Lastly, I may be deemed a heretic for saying this, but it's not too bad dipped in gyoza sauce! I just made this, and I have to say... I don't like it. It was the soft mushiness of the inside that really put me off. But when I cook the rest of the tofu (I only used half) I'll cut the pieces much smaller, so there's less of the icky soft inside and more of the crispy outside. LOL I just came here to comment noe that my husband and I loved this...and I see the person who commented above. What Iliked was the contrast bet. the soft tofu and the crisp bacon and the way the bacon flavoured the tofu. I suppose everyone is different. I wish there was a vegetarian equivalent of the smokey sweetness of bacon. I don't like tofu much... it's useful, but not very tasty without a lot of work. it's surprising, cos when I first read your first and second line, I thought you meant tofu was the "food of gods", since I love tofu, and well, most parents think of bacon as unhealthy. I just love tofu. My favourite dish is mashed tofu and century egg, i know restaurants tend to serve it in a whole tofu block, but I just put everything into a bowl and start mashing. hehe, but my boyfriend, who is white, thinks i'm crazy for eating tofu! But I'll have to try making this for him! How well does this keep in the fridge or freezer? Wow... very interesting i like bacon and tofu . i will make it for break fast. tnxs for the idea. Because of your helpful instructions I started making the most delicious (and simple) homemade tofu. The idea of wonderful, homemade tofu flavored with savory, crispy bacon is fabulous! This is even tastier than it sounds!! I made this in the brown sugar and soy sauce version. It failed utterly to make it to my buffet type lunch because the smell attracted too many people to my kitchen and each of them ate at least one. In my comment preview list I only saw up to "It failed utterly...". Scared me there for a bit ^_^; I'm glad everyone liked it so much! What happens if you bake tofu? Does it keep the same consistency or melt? I'm using this tofu recipe to replace scallops. I would usually bake these fine little hors d'oeuvres to keep the savory flavor. Doesn't this inspire you to be a vegetarian! Perhaps there should be a term such as baco-tarian - one who is vegetarian, but still eatsa bacon. "One is revered, serenaded, hailed as the food of the Gods..."
For a moment there, I truly thought you were describing tofu. Now bacon just goes without saying, but I do find tofu to be equally delicious. Putting the two together is a fantastic idea. I am drooling!!! This recipes deserves to be bumped every now and then. Recently saw this on Harumi Kurihara's TV show and it has become a staple in my kitchen. 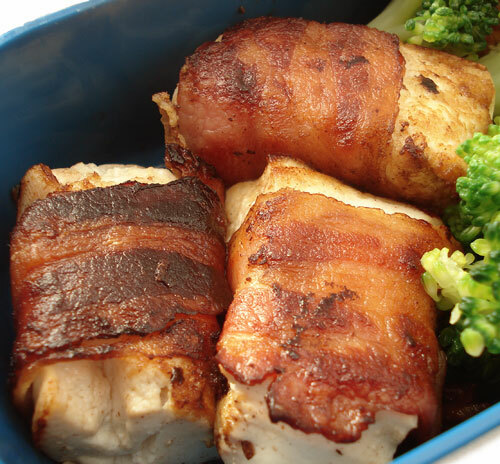 It's great to be able to pull out a couple of precooked cubes of bacon-wrapped tofu for breakfast or a snack. I also find that if I reheat it briefly in the microwave, the tofu becomes fluffy. I've tried adding a shoyu and brown sugar glaze, but while tasty, DH and I prefer the simple smokiness of a really good bacon. Wow! Just tried this, makes me think of bacon wrapped crab. :D The only blunder that I made though was not catching the part about wrapping the bacon once around the tofu.... Luckily though I was able to remedy the situation by popping them in the microwave. Thanks for sharing the recipe! dude you just ruined some perfectly good Tofu with rotting antibiotic laced pig flesh!!! This would make a wonderful, inexpensive lunch! I'm going to have to try it.